Recently players of LoL decided who would win in the eternal confrontation of Order and Chaos. 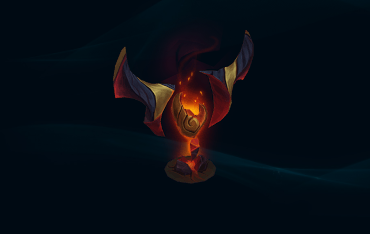 During this event, you can participate in the Missions (VS. is the first event in LoL that include Missions) and receive a reward for completing them. Riot Games is planning that the Missions will be a regular part of the LoL, so stay tuned. You have no reasons to swap your favorite champion or a favorite role to complete these missions because Riot Games make them accessible for everyone. To choose a side in this confrontation, all you need to do is to pick the Order or the Chaos icon and play with it during the event. By the way, you can easily swap the sides during it, so do not fear if you mistakenly chose the wrong side. The winner will be determined by the tokens collected from the players, games played with special VS. Icons, and a game where Yasuo was fighting against Riven. Riot Games do not share any accurate information about those points, but you can easily check the special meter at the event page. If you chose the Order side then you will receive the “Awakened” Mission that disables the Chaos mission named as “One Blade, One Purpose“. All you need to do is to win one matchmaking game. As a reward, you will receive 10 Order Tokens. 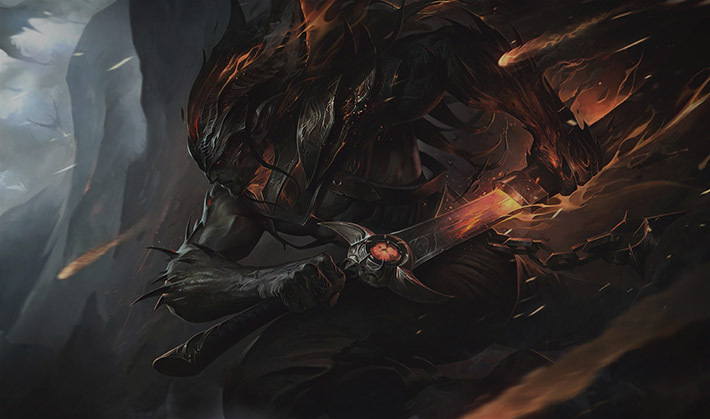 Let’s start our lol skin review with the winner of this event, Champion of Chaos – Nightbringer Yasuo. In summary, this new Legendary skin looks awesome: dark flame color scheme, awesome emotions, taunts and new recall animation, and his alternative form is badass as hell. He still looks like a samurai, but the whole perspective of this champion was turned around. 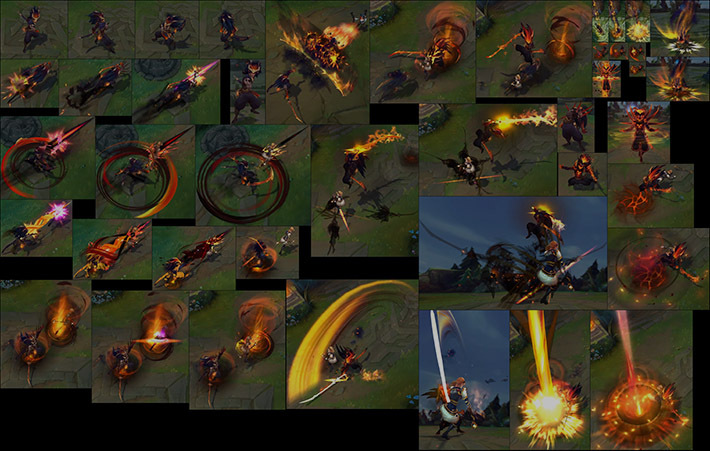 Nightbringer Yasuo received a whole new model, that looks a slightly familiar. Yep in some things, it reminds a classical skin, but there are a lot of differences, just look at this fabulous flaming hair, with some kind of a crown. Perfectly emphasizes his demonic nature, as well as his eyes burning from the inside. Also, as a gift of the chaos gods, Yasuo received bony growths and flaming hands. And I want to highlight this marvelous demonic sword that burns by itself and can cut through literally everything. Now let’s talk about his new animations and else. When Gathering Storm is ready to be used, some new textures appear, that looks really nice. And after releasing a whirlwind the bone spikes appear in his arm. Especially I liked the new Last Breath, textures were changed to the fire ones, and while he in the air, his blade starts to burn with attractive flames. Yeah, these not such great and memorable changes, but they perfectly fit his new form. Particles are nice too, but the only thing what Riots did – the change wind to the fire. No, I do not say that this is not the right approach, but I expected something more. Way of Wanderer is now looking as a firewall, auto attacks flames with fire, and even Whirlwind now has a fire nature. Sounds is my favorite part and they are done great, but not perfect. All abilities now accompanied by a burst of flames, while auto attacks now sound like a slashing metal. The new voice of the champion is a really another thing, deep, frightening voice, that exactly what I have expected from the Nightbringer Yasuo. 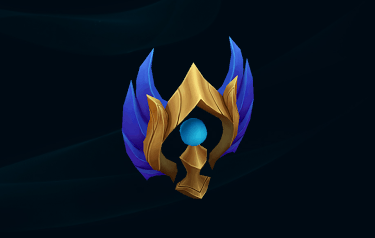 So what can I say about Nightbringer Yasuo? This is a great skin for all players that love the dark thematic skins. Especially it will be great if you participated in the Order Vs. Chaos event on the dark side, and now you can buy this skin as a small reward for pushing your team to victory! You can buy Legendary skin Nightbringer Yasuo for 1820 RP in the LoL in-game store. Dawnbringer Riven is a brilliant Legendary skin that represents Riven as an Angelic Warrior of the Order. She received a wonderful new model, the whole bunch of great animations and completely rewritten sound effects. 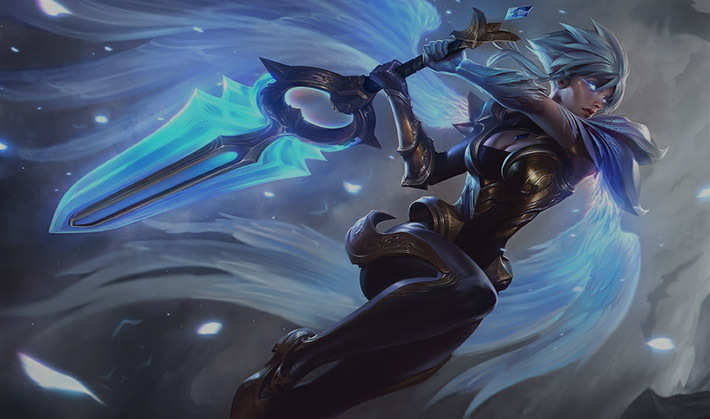 Riven’s new model looks awesome both in splash art and in the game. Gorgeous color scheme, colorful and vibrant. Riven received attractive skin which is not too distinguished by the originality of the idea but made with the skill inherent to the Riot Games. Dawnbringer Riven obtain an angelic arm, which repeats the form of a plate shoulder plate. All parts of her outfit look perfectly: Light blue hair, translucent angel wings, and sword that was made from a blue mineral. Her alternative form (when Blade of Exile activate) looks awesome but still is too familiar to Super Sayan form, which is hilarious. Particle effects that were added to this skin are nicely done. 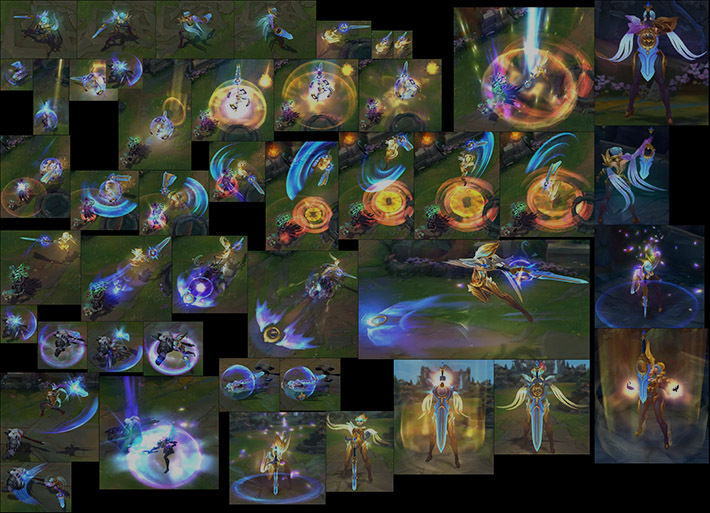 All her abilities, auto attacks and emotes were enhanced with beautiful blue particles. Runic Blade now has a blue glow and interesting light-based guard. Especially I love the new Wind Slash. Now it has fabulous blue wings and leaves a translucent blue trail. They perfectly fit the supernatural personality of Dawnbringer Riven. Let’s go straight to the SFX, now Riven’s auto attacks sound like a crashing crystal. But the only difference is only in the loudness and length. Blade of the Exile add a bell chime, that feels much more angelic and relaxing. Voice lines were rewritten and sound much better, with a supernatural tint in her voice. Animations. New animations are similar to the old, classic ones, but still, they have something in it what makes you fall in love with them. Auto attacks, abilities now looks softer a bit, less rigid. Not bad at all, but still mostly identical to the classical Riven skin. But other animations are great, new emotes, taunts, recall. Especially Recall and Death animations really fit the angelic theme. Endspiel. If you really love the angelic theme, do not expect innovation from new animation, and just love Riven so much, then you probably must buy this skin. But to all others, I highly recommend you to wait until this skin will be on sale. You can buy Legendary skin Dawnbringer Riven for 1820 RP in the LoL in-game store.